Witnesses of the deadly California bar shooting in which 12 people died on Wednesday night have spoken out about their dramatic escape from the tragedy. 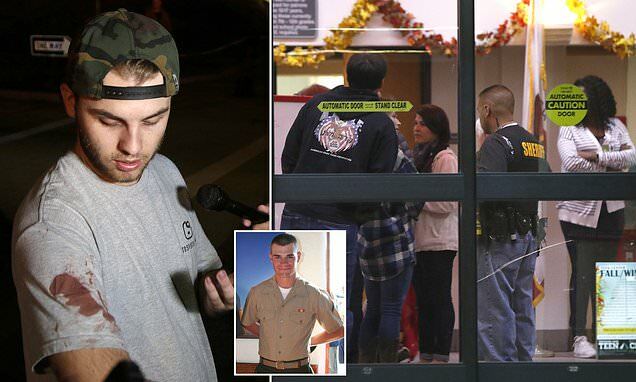 Ex-Marine Ian Michael Long, 28, opened fire at the Borderline Bar and Grill in Thousand Oaks, California killing 11 people before turning the gun on himself. According to police the bar had been packed out with college students enjoying a 'country-themed' night of dancing as Long entered firing a hail of bullets into the unsuspecting crowd. 'I heard shots and that's not a noise you mistake for anything else,' said Matt Wennerstrom, who was in the bar at the time of the deadly incident, said. 'At that point I grabbed as many people around me as I could and grabbed them down under the pool table we were closest to until he ran out of bullets for that magazine and had to reload,' Wennerstrom added. Ben Campbell said he was dancing when he heard the gunshots and immediately hit the ground. 'The windows broke and I just hopped out the window and I was one of the last people out,' Campbell said. John was inside the bar near the front door with his stepdad. He said they watched the gunman shoot the bouncer and then move through the bar.